Sfogliatelle are baked pastries made up of lots of thin layers and shaped a bit like a sea shell, also filled with a sweet ricotta cream. Strufolli are very small balls of dough which are deep fried, rolled in honey and topped with sugar sprinkles. And now on to this week’s book, 100 Desserts To Die For by Trish Deseine. Former BBC TV cooking show host Trish has created a collection of desserts for all occasions. The vacherin and cheesecake are sure to impress any dinner party guest. Enjoy! Preheat the oven to 150°C/300°F/Gas Mark 2. Beat the egg whites and 50g of the sugar to soft peaks in a mixing bowl using an electric beater, then add the rest of the sugar, little by little, until the meringue is firm and glossy. On a baking tray lined with baking paper or a silicone mat, spread out the meringue to make 2 discs about 20cm in diameter. You can make the discs out of spirals of meringue using a piping bag. Immediately lower the temperature of the oven to 100°C/200°F/Gas Mark ½) and bake for 1 hour. Turn off the oven and let the meringues cool for 2 hours with the oven door ajar. Place one of the meringue discs in a high-sided 20cm round spring-form cake tin. Trim the edges if you need to so the disc fits inside the tin. Spread a layer of vanilla ice cream on the first meringue disc, then a layer of raspberry or strawberry sorbet. Smooth the surface before placing the second disc of meringue on top, pressing down very lightly. Using an electric beater, whip the cream with the mascarpone, icing sugar and vanilla extract until light. Top the vacherin with the whipped cream. Place the vacherin in the freezer until the cream has set. To unmould the vacherin, take it out of the freezer 20 minutes before serving and warm the surface of the tin with your hands. Serve the vacherin with fresh fruit, whipped cream and a raspberry or strawberry coulis on the side. Make the cheesecake. Crush the biscuits in a small mixing bowl. Add the melted butter and combine, then cover the base of a tall round spring-form tin, about 25cm in diameter, with this mixture. Place it in the fridge. Heat the cream in a saucepan, then pour it over the chocolate. Let it stand for 1 minute before gently stirring to melt the chocolate and make a smooth ganache. Place the ganache in a cool place and let it cool completely. Once the ganache is quite cool, whip it with an electric beater until light, adding the cream cheese, then the mascarpone, once the cream has started to hold its shape. Beat together well. Spread this mixture over the biscuit base and smooth the surface of the cheesecake. Place in the fridge for 2-3 hours. 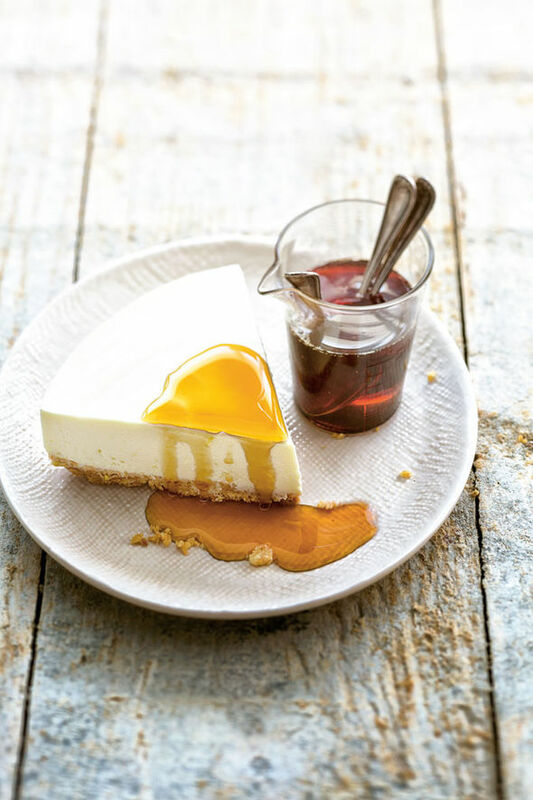 Before serving, combine the maple syrup with the bourbon and serve this syrup alongside the cheesecake.